Sales of gold jewelry products are hitting a peak in China as the Spring Festival approaches, boosting domestic consumption. Industry analysts said demand for the metal will see a steady upward trend this year as the country's economy maintains strong growth momentum. "Gold jewelry in the form of a pig has sold well recently, as 2019 is the Chinese Lunar Year of the Pig. 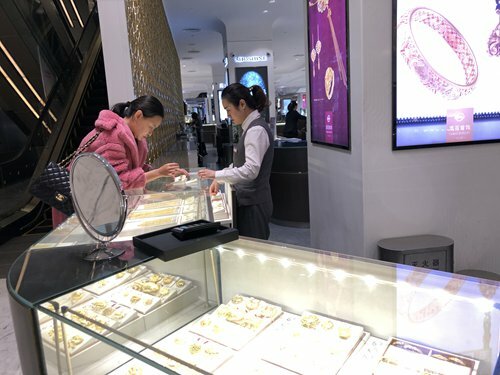 Gold jewelry sales usually peak between the New Year holiday and China's traditional Spring Festival," a salesperson surnamed Geng at a Chow Tai Fook retail store in Beijing told the Global Times on Monday. However, Geng said that young people in first-tier cities are less inclined to buy pure gold jewelry compared with platinum or diamonds. According to a survey released by the World Gold Council (WGC) in November last year, diamonds and platinum are as popular in China's first-tier cities as pure gold. In second- and third-tier cities, pure gold is still more popular. Meanwhile, young people tend to spend less on gold jewelry compared with their elders. "The domestic gold market, mainly driven by consumption and investment, will continue a recovery with demand from second- and third-tier cities at a continuously high level, especially for jewelry," said Zhou Yinghao, an independent analyst of the gold industry. Zhou told the Global Times on Monday that China's gold market has become more open and normal in the past few years, and gold has become a good alternative investment since there are few other choices. "The country's economic and wealth expansion will further enhance demand strength in the gold sector," he added. In the first three quarters of 2018, China's gold consumption rose to 849.70 tons, up 5.08 percent year-on-year, ranking first in the world for fifth consecutive years. The total included 538.85 tons of gold jewelry, which saw yearly increase of 6.94 percent, figures from the China Gold Association showed in November last year. Jiang Shu, partner and investment director of Shanghai-based Oak Investment, told the Global Times on Monday that about 60 to 70 percent of domestic consumption is concentrated on gold jewelry. Still, it's become obvious in recent years that Chinese consumers tend to separate decorative functions from investment value. "The gold market of China was opened up late but has caught up with the average standard worldwide over recent years," said Jiang. Investment demand for gold has been climbing, said Jiang. Affected by the sluggish stock market and trade friction between China and the US, investors have paid more attention to gold coins out of the need for risk avoidance as gold is often used as a hedge against economic uncertainties. Gold coin consumption was up by 6.47 percent in the first three quarters last year reaching 18.1 tons, according to the China Gold Association. The gold price is often influenced by the US dollar-yuan exchange rate. Zhou forecast that China's gold price will see a slight rise this year as domestic demand continues to grow. A Beijing-based white-collar worker surnamed Chu told the Global Times on Monday that he has invested about 20,000 yuan ($2,944.7) in paper gold, which he bought at a domestic commercial bank in the past three years. The price rally in 2017 was offset in the past year, so I've barely got any profits so far, but this year is likely to see the price go up as the US dollar will turn weak, he noted. Higher interest rates combined with a strong US dollar can dampen gold's performance, and there are reasons to believe that the upward trend of the US dollar may be losing steam, according to a report on global economic trends and their impact on gold released by the WGC. In the long term, the rising middle class in newly emerging markets, gold's function as a hedge against risk and the metal's broader use in the high-technology sector will combine to support its price, said the report. It also pointed out that emerging markets, China and India in particular, making up 70 percent of consumer gold demand, will back up the metal's long-term performance. India's gold market faces more exchange rate risks since most of its gold is imported. China's imports account for half of its consumption, Zhou said.